Coding Relic: Death of Copper Predicted. Film at 11. Every handful of years we ratchet up the Ethernet link speed: from 10 Mbps to 100 Mbps in the early 1990s, to 1 Gbps in the mid 1990s, to 10 Gbps in the early part of this century. 40 Gbps is the next target. At the 1 Gbps and 10 Gbps transitions naysayers maintained that copper cables would never be able to meet the required signaling rates and that optical would prevail. The same doubt is now being voiced about 40 Gbps. During the 1 Gbps and 10 Gig transitions, optical media became available several years before copper, and then the initial 10 Gig copper specs were limited to patch cable distances of 10-15 meters. 40G will repeat the story with optical products already available, substantially before copper. Nonetheless I'd wager 40G copper transceivers will eventually appear in some form. Yet this time, optical will win. Not because of the technology or limitations of copper wire, but because of economics. Economics used to be in copper's favor: simple install and no expensive lasers. Copper could ride the silicon technology curve, throwing ever more DSP power at the problem. Times have changed: cat6a and cat7 cabling is as difficult and expensive to install as fiber, and solid state laser components allow optical transports to ride the silicon technology curve. Like fiber, cat6/7 cables have a minimum bending radius. Pull too tight and the cable can no longer handle long distances. Like fiber, cat7 does not tolerate being stretched. Stretch a 100m cable by a centimeter and its performance suffers. Even padded cable staples put too much pressure on the cable. cat7 must run in a tray or conduit, and the bulky shielding means fewer of them will fit. cat7 cables are very sensitive to connectorization. The crimp tool you used for cat5e won't do. The other problem with copper cables is that they are made of copper, an actively traded commodity. The chart below shows the raw material cost of copper over the last century, normalized to the US Dollar in 1998. During much of the late 1990s and early 2000s copper was cheap by historic standards. In the last few years the commodity price has trended back up due to demand, without a matching increase in new supply. If there is a natural ceiling for copper pricing where the market will seek alternatives, we do not appear to have hit it yet. I'm not predicting that 40 Gig copper transceivers will be impossible. 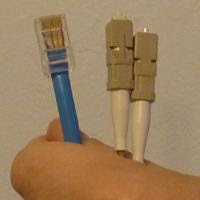 On the contrary, I suspect there will be two solutions brought to market: a very short reach spec using RJ45 patch cables, and a 100m spec which imposes more painful requirements like cat7a/cat8, use of multiple cables, and electrically better connectors (presumably also manufactured, not connectorized on site). These products will eventually appear, substantially lagging optical product availability. I simply suspect that the economics no longer work in coppers favor: patch cables from one side of the rack to the far corner will be long enough to have to worry about install quality. If the pressure from zip-ties fastening the cable to the rack threaten the operation of your network, you're better off using fiber. 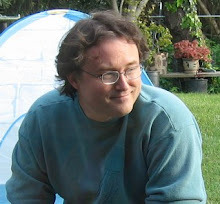 The genesis of this post came as a comment on Stephen Foskett's excellent Pack Rat blog. It is an excellent resource, highly recommended.